and What I Wore Wednesday! 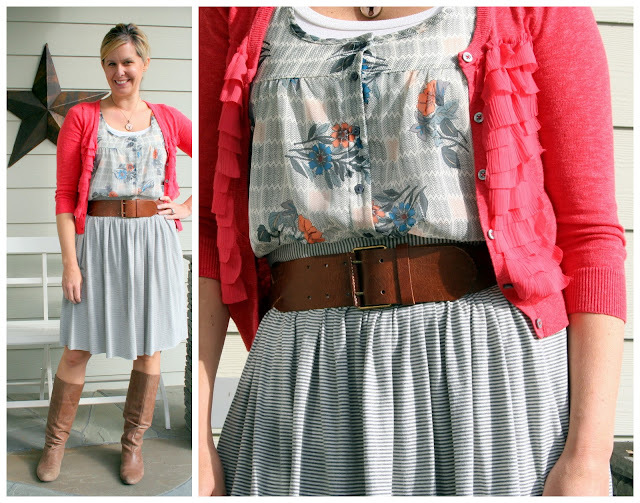 And as always, linking up with the adorable Lindsey for even more fashion inspiration! Everyone knows I love a Stacy Lynn skirt. I purchase mine at The Queen Bee Market. I own three. Kaia owns four. This knit one is one of my favorites and I got brave this week and paired stripes with a pattern! For Day Two....Stacy is kindly giving away a skirt from her shop? and her Navy Jersey Skirt! Hop on over to her shop and tell me in the comment section. Winner will be announced at the end of the 12 Days of Giveaways! I ♥ you even more than your skirts! I love the Stacy Lynn items. I definitely love the small yellow full skirt. I love the print on the fabric but my favorite part would have to be the pocket detail. So adorable!!! Merry (almost) Christmas. I love the eggplant jersey skirt! So many lovelies. Oh I could use a cute yellow skirt to spice up my wardrobe! 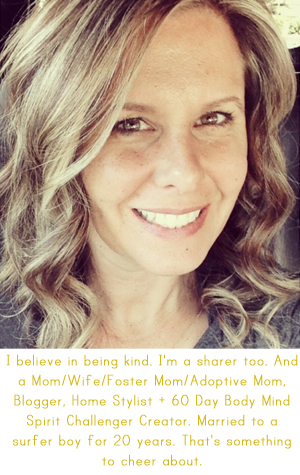 So many great items in her shop! I love the yellow full skirt, too! All her skirts are adorable, but I would have to choose the jersey skirt in eggplant!!! I, too, love the yellow full skirt! Her skirts are so pretty! I would choose the small eggplant jersey skirt. Lovely! 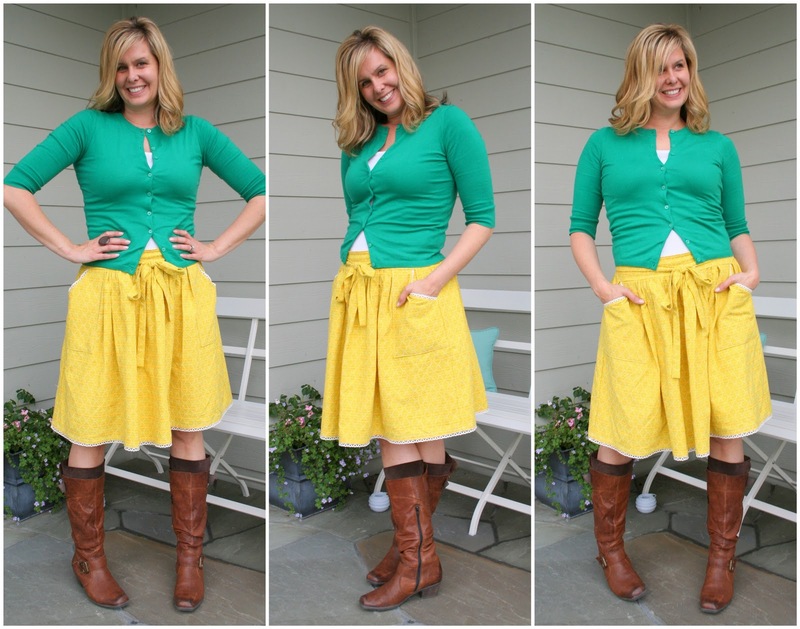 Love the full yellow skirt, the pockets & subtle pattern are great! I am just getting turned on to Stacey's skirts thanks to you and linkers from The Pleated Poppy! I adore the purple/plum color! Love the yellow skirt....and the plum. Btw, that first outfit is darling! One of my favorites of yours! I love the eggplant skirt. It is a favorite color of mine for Fall & Winter. Very Cute! I love the navy. Her shop is super cute! The eglantine skirt is great! But did you see her cute scarves and flower pins? Wow! Super cute! 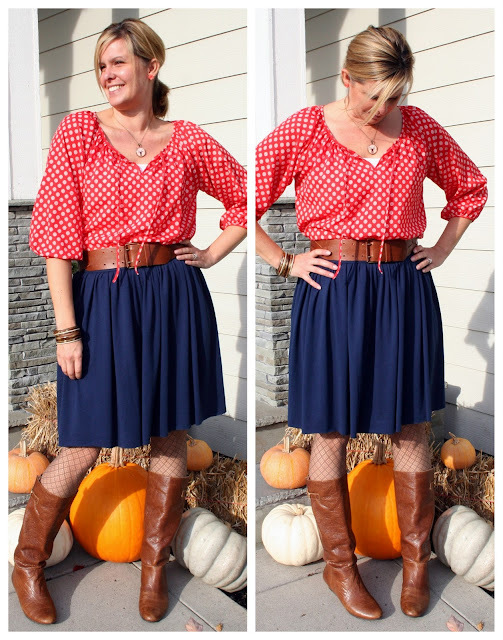 I love the red eyelet ruffle skirt and her scarfs are really cute too! her skirts are so cute! I love the yellow eyelet skirt..would be perfect for spring/summer. I love the skirts! My favorite is the yellow eyelet skirt, it looks so sweet and happy! I love her skirts! Especially the Yellow Eyelet full skirt! Navy jersey skirt for me. I love it with your red top! Fun giveaway. I like the Navy Jersey skirt too. Thanks! I love the yellow....very pretty!! I also really like the the striped you have on too! I love the eggplant jersey skirt! Looks like something I would want to wear every day! Cute skirts! I'd pick the yellow one! i love the ivory eyelet skirt! Yellow full all the way!! I'd love to have one of the yellow skirts! All of her skirts are darling! I think I might step out of my comfort zone and try the yellow full. How fun! I love the navy jersey skirt. I'm also glad to know where you get all your cute skirts! Cute! I love the colors you put together! I wish I was good at doing that. :) I love the yellow full skirt! I love them all! You look so great in them! I would love the Red Eyelet Ruffle Skirt in Medium. I didn't know she has hats!!!! Yea! I would get the navy jersey skirt. 1st- How do you find time to blog and host awesome giveaways with 2 tiny ones in the house?! You are amazing! Quick question April. Got my necklace/earring set I purchased, love! Where do you get your mini-cards printed? I love the eggplant jersey skirt! too cute skirts! thanks!! I love the navy jersey skirt. It would definitely go great with my wadrobe!! I like the navy jersey skirt the best but her striped ruffle scarfs are adorable too! I love the red eyelet skirt! i love the full yellow skirt! These skirts are so pretty! I'd choose the yellow full skirt! Thanks for the chance. I like the eggplant skirt. It's just my style. The full yellow skirt is my fave! I like the eggplant one, so pretty.. I would pick either the egg plant or the yellow full skirt in medium. I can't choose! I'm loving the eggplant skirt...purple has always been a favorite of mine! I'd choose the red eyelet ruffle skirt! I love the eggplant jersey one but if I am being honest I like your gray and white one striped even more! I would loooooove a jersey skirt! So simple and comfy, yet cute! i'm loving the yellow skirt! turquoise eyelet without a doubt! I own 2 of her beautiful skirts and love them! She is the sweetest! I definitely love the full yellow skirt! I love the full skirts! I tried to buy one at the Queen Bee Market in August, but she was sold out of my size! i love the eggplant skirt! My favorite is the ivory eyelet skirt. love the full yellow skirt! it would be perfect for my engagement photo shoot next month! love love love the full yellow skirt! It looks so cute on you April! The yellow skirt is too too cute! Those skirts are adorable! I'd definitely pick one of the full skirts - large yellow or large pink! I would love the yellow full skirt - so pretty!! Too late? My RSS feed is so stinkin' delayed. Love the yellow full skirts right now! I would get the large navy jersey skirt! it looks like it would travel well! So many things to love! I love the navy jersey skirt and the full yellow eyelet skirt! I would pick the navy jersey skirt, but the other colors are so fun too; the yellow is so playful. Eggplant jersey would be a great addition to my wardrobe! Thanks for the opportunity, April. I would pick her yellow skirt for sure!! I would choose the navy as I am pregnant and only stretchy things fit me now :). Hi! Lovin' the Navy Jersey Skirt! Perfect for all the seasons! loving her eggplant jersey skirt!! All the jersey skirts are perfect, but I love the yellow one! I can see it with some grey tights now.